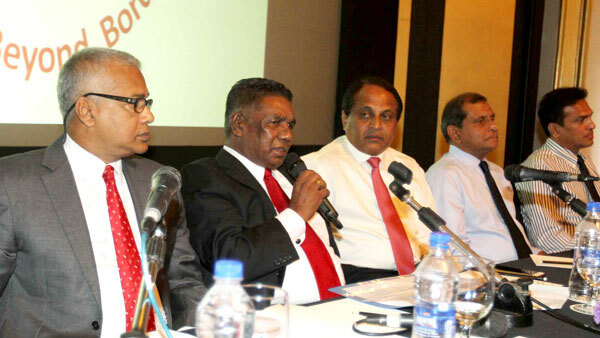 The 11th Annual General Meeting of SLASSPA (Sri Lanka Security Service Provider Association), under the theme "Thinking Beyond Borders" was held on Novermber 28 at theTaj Samudra, Colombo under the distinguished patronage of Eng. Karunasena Hettiarachchi, Secretary, Ministry of Defence. Delivering the welcome address, Major Tissa Aluwihare, President of SLASSPA, said that the presence of Eng. Karunasena Hettiarachchi was a great boost for the entire industry and a motivating thought for all stakeholders in the quest to uplift the industry. He noted that this gesture set a positive note for the future to achieve the aim of "One Vision, One Industry, One culture" for the Security Industry. Speaking further, he stated that the Industry is faced with some major challenges such as the severe shortage of manpower, ruthless price undercutting, non-compliance of certain companies - for example, by not paying even the stipulated minimum wages to hard-working guards, by not paying EPF/ETF, by letting guards work in in-humane working conditions. As a first important step Major Aluwihare initiated the first ever "CEO Forum late 2014, to which SLASSPA invited all the stakeholders of the industry to educate them on the need to be compliant as a first priority - for example: pay their salaries and statutory benefits properly and timely. "In the 3rd phase, we then invited all the stakeholders to a forum with the theme "Think beyond Borders", where we addressed the owners of the security companies not to undercut prices, but to demand fair, workable rates from potential new clients as otherwise it would only result in a disgruntled guard force delivering poor service. A "no-win" situation for the guards, the clients and the company". "Such a scenario can only be achieved if awareness levels for each other's' needs are high and TRUST between all parties has been established. As good industrialists, we can all make that difference. The bottom line issue remains: The very poor trust levels that exist in this industry". The chief guest, Eng Karunasena Hettiarachchi, stated that this was the first occasion on which he was meeting the leaders of the Industry, since taking over as Secretary Defense last month. He said it is heartening to note, that a majority of the recognized security companies are within the SLASSPA fold, and that this augurs well for the industry. Speaking further, he said "Commercial security is an important auxiliary arm of the security machinery in the country and augments resources of the law & order establishment as part of the national security grid." He made it clear, that he in his new capacity would insist on industry-wide adherence to standards, as this is the only way to uplift the image and respect for the trade. This can only be achieved by compliance with statutory requirements, such as the payment of minimum wages and EPF/ETF etc. As the drivers of the Industry, he mentioned, it is crucial for all members of SLASSPA to set an example in this regard, which compels the rest of the Industry to follow. Col. Jayavi Fernando, SLASSPA Senior Vice President, also spoke on the occasion.